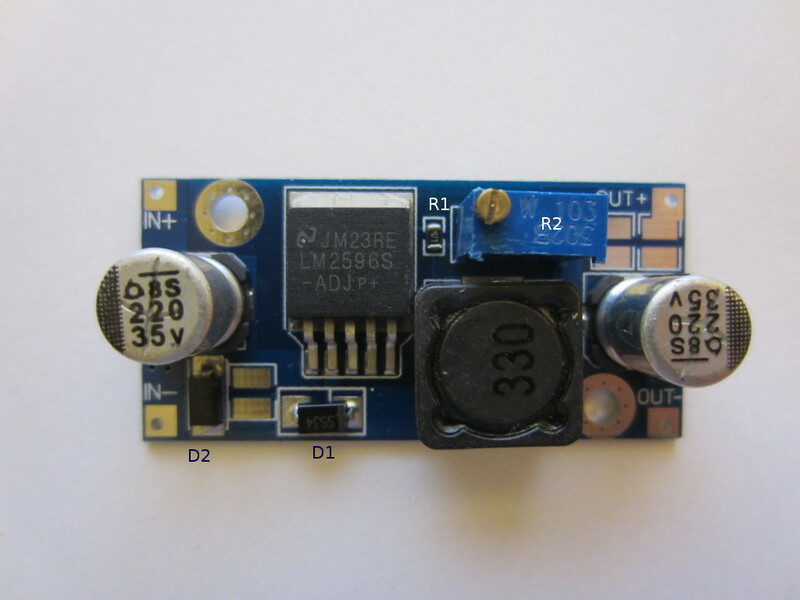 LM2596 based step-down DC-DC converter modules can be bought on eBay quite cheaply for around a dollar each. But how do they perform? Is it safe to use it to power your design? Let’s find out. According to TI’s website, these LM2596 step-down (buck) regulators are sold for $1.8 each for a quantity of a thousand. So how a finished converter could be sold for just above a dollar each is quite a mystery to me. Anyway, the picture below is the board I received. It appears that there are a few variations to this design (slightly different inductor size or capacitor size/voltage rating, etc.) but they all are largely based on the reference design. Below is the reverse engineered circuit diagram of this particular converter board I have (key components are also marked in the picture above for reference). The inclusion of a polarity protection diode (D2) is certainly a nice feature. It will prevent you from damaging the regulator should the input voltage be reversed. Of course, if the input power supply has very low output impedance and high current capability this tiny diode might not be able to save the board in an input voltage reversal situation. Also, not all variants of this step-down DC-DC converter have this diode. Although LM2596 can handle input voltages up to 45V, the input and output capacitors used are both rated for 35V only so in practice input voltage should stay below 30V for long term uses. For LM2596, the output voltage is determined by the equation below. Given the component values used in this module the output voltage can be adjusted between 1.23V to 25V. Although LM2596 is rated for a maximum current of 3A in continuous operation, the tiny surface area of the ground plane on this board is not sufficient to dissipate the amount of heat generated over the entire operation range of the converter. And the efficiency of this converter varies quite a bit depending on the input voltage, output voltage and the load current. The efficiency can range from 60% to 90% depending on the operating conditions. As you can see in the video later, a heatsink is a must if continuous operation at over 1A is required. According to the datasheet, a feedforward capacitor is needed in parallel of R2 when the output voltage is greater than 10V to ensure stability. But this capacitor is not present on this converter board. Even though in my limited testing the module was able to work across its output range, I would not recommend using this module to supply power to sensitive devices if higher than 10V supply voltage is needed. Instabilities could cause the output to deviate from the set voltage. Simple switching regulators are typically designed to work optimally within a small range of output voltages once the key components (e.g. the inductor) had been chosen. This can be clearly seen from the datasheet in choosing inductors and output capacitors. In the video below, I tested this DC-DC converter board under various operating conditions and measured its efficiencies. To conclude, these switching regulator boards are well suited for low to medium current draw digital circuitry but for higher current applications a heat sink is needed and even so I would not recommend running it at the maximum 3A load especially if the input voltage is high. To your question how can they do it? They can’t. These chips are fake. I’ve verified this by comparing to real ones direct from TI. Fake ones switching frequency is 27khz or 57khz or something other than 150khz. Fake ones have no thermal protection and will self destruct and dead short under load. Also compare output waveform to the datasheet. Not even close. Real one has thermal protection, and real one switching frequency is 150khz, regardless of load, end of story, period. I bought some of these for a project involving a 30V supply, converting down to 5V. Due to a rather cheap breadboard I ended up with a short circuit on the output side (I think), regardless the results were very rapid clouds of very unpleasant smoke. Plus a dead arduino clone and Bluetooth board. Thankfully nothing was plugged in to my computer at the time! Hopefully my mistake can highlight the dangers to other people. Not sure what you could do to protect against this sensibly – trying to find a source of boards with genuine TI parts would seem like the safest bet..
Ebay, Banggood, Ali, or other online sites all sell fakes. 99.9% sellers sell fakes on 99.9% of their products especially electronics and electrical. Lets face it, who will buy expensive original from these strangers who cannot guarantee anything. As we know China needs to sell cheaper to compete with all other countries and the solution is fakes or very much lower qualities then the competitions. Then those sellers never care anymore and just cheat their way out, and this is China way. Big companies selling originals like RS, Farnell faces problems because of these cheap fakes. We cannot blame ourselves being the cheapo buyers but we must blame ourselves for being too cheap and neglect precautions. So before you use any of these products from them, you must prepare precautions like fuses or circuits. You even have to calculate these things are 50% and lower efficiency because they had been proven so on some items. Kerry, good job there with the temperature measurement too. If you can test with 3A which is this chip’s max amperes, it would be better. A quick search on the ‘net and I discovered that these are actually Chinese LM2576 clones marked as LM2596. The LM2576 is an older chip running at 52KHz with the same pinout. A quick look at the output waveform at pin 2 with an oscilloscope should confirm it. This chip also did not need the feedforward capacitor across R2. Due to its lower switching frequency however, the LM2576 needs a 1000uF capacitor at C2. It would be interesting to see how much ripple there is at higher currents with only 220uF. Although given the inductor and output capacitor values it suggests that the switching frequency would need to be higher than that of the LM2576. E.g. 150 kHz vs. 52 kHz. 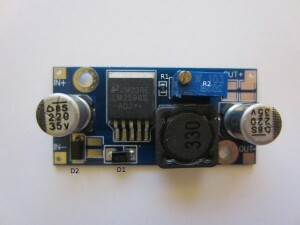 With both – active and passive cooling, as well as with 1000uF output capacitor, I’m using these boards at 3Amp CC battery charger for several years. They peak at 4.5amps, but do their job nicely at 3 Amps. Chip temperature doesn’t exceed 70 degrees, but to achieve that – a 12V active cooler is needed (5V can’t handle it). I just tested my “LM2596” modules, and found they are switching at 56kHz. @flegmatoid: I linked to an Aliexpress listing for MP1584 modules selling for 42c ea, so it would cost you little more than a coffee to find out if they are any good. I’ve bougt these from several different chinamen. Some switch at 50kHz, others at 150kHz. Next time I’ll leave a negative review if the’ve relabeled the chip. please reply earliest on priority.